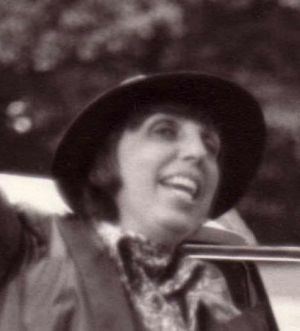 Taffy Epstein (nee Harriett Gombossy), owner of Taffy’s Inc. from 1954 to 1990, died on June 10, 2013. She was 92. Born on July 20, 1920 in Akron, Ohio to Gertrude Klineman Gombossy and Julius Gombossy, Mrs. Epstein graduated from Cleveland Heights High School and Miami University. If one were to condense her life into a two-hour movie, one would have to leave out the taxi ride from Rome to Florence on Christmas Eve, and being kicked out of a convent hostel for returning at 3 a.m. with convulsive laughter. A life-long Clevelander, she was also a die-hard Indians fan, being a Base-Belle and having had a childhood crush on Bob Feller (they both took breakfast at Clark’s across from Cleveland Heights High). From humble beginnings in a small dancewear store in Cleveland’s Arcade in 1954, Mrs. Epstein made Taffy’s a nationwide dance boutique, with 14 retail locations from Boston to Atlanta to Dallas to San Jose, including a location at 57th and Broadway in New York City. After selling Taffy’s to Capezio in 1990, Taffy started a take-out delivery service called Dinner is Served. In 2011, when Mrs. Epstein learned that a dear friend’s daughter had been diagnosed with Parkinson’s disease, she single-handedly raised enough money to start the Yes…I Can (!) Dance program at the Mandel JCC. With no pretense, with no duplicity, with apologies to no one, and with compassion for all, she always walked her path, whether it was over the mountain, around the mountain, or straight through the mountain. She always walked the path of her heart. Mrs. Epstein is survived by her son Steve Epstein of Ageo, Japan; daughter Susan Epstein of New York City; and grandchildren Mika and Boone Epstein. She is predeceased by her parents, her husband Harvey L. Epstein, and sisters Celia Schenkel and Rose Ann Shensa. The family will be receiving friends and family at the residence on Saturday, June 15 from 1-9 p.m. and Sunday, June 16 from 1-6 p.m. Contributions are suggested to Shaking with Laughter for the Yes…I Can (!) Dance Program, 2683 West St. James Pkwy., Cleveland Heights, OH 44106 orshakingwithlaughter.org.